With the increased popularity of adventure bikes, so increases the need for good camping gear suitable for your motorcycle excursions. You want gear that is lightweight and compact so you can pack all you need without exceeding your bike’s maximum weight rating or your storage capacity. 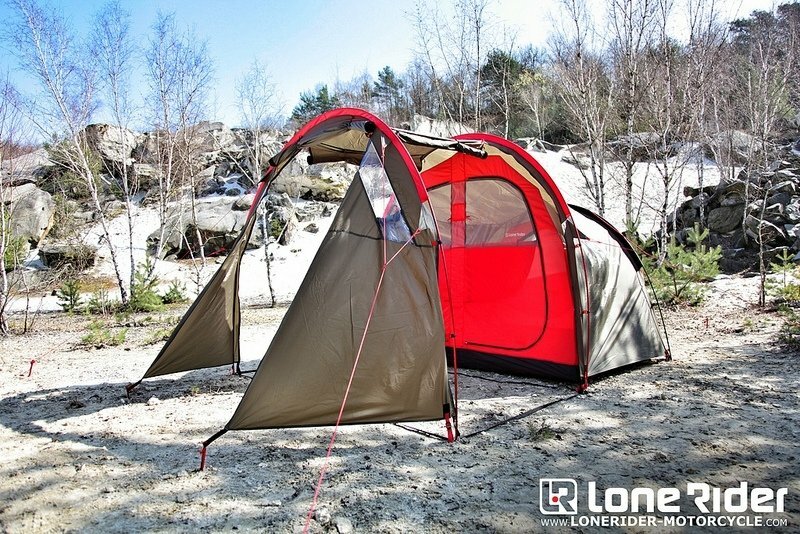 Looking at tents, the same criteria for backpacking fits the bill for motorcycling. It must be lightweight, but strong and waterproof, and pack into as small a package as possible. What separates your adventures from a backpacker, however, is the availability to park your motorcycle in the tent with you — protected from the weather and safe from prying eyes — while you sleep. Not all of my picks for best motorcycle camping tents let you do that; things like ease of assembly, quality and creature comforts took first priority. 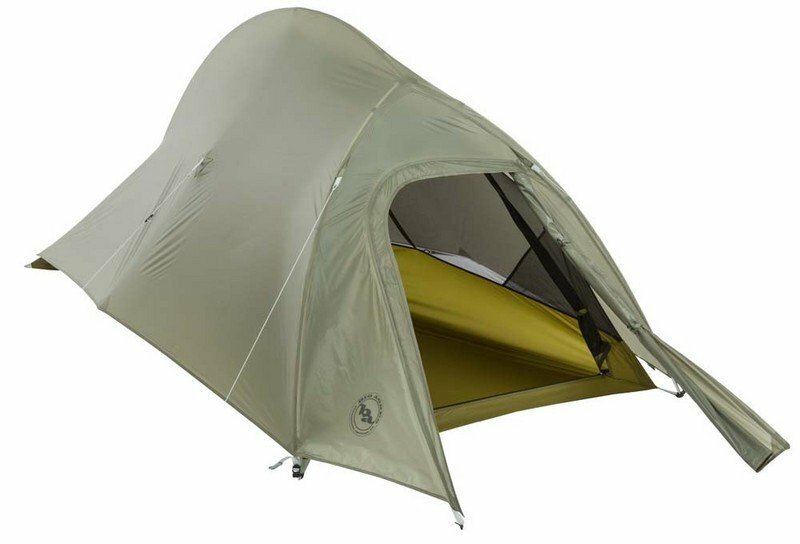 If your adventures are solo or you only need to provide shelter for yourself, Big Agnes makes the Seedhouse SL1 tent in Titanium Green for $279.95. With a large D-shaped door, excellent ventilation, quick setup and waterproof nylon, the Seedhouse SL1 packs up into a roll 4 inches by 17 inches that weighs just over two and a half pounds. That’ll fit quite readily in a saddlebag or strapped across your handlebars. It’s a three-season tent with reflective guylines and tent webbing so it is easy to find when making your way back from a midnight nature call. The Seedhouse SL1 has two interior mesh bags to stow your gear, and has gear loops installed to accommodate the accessory overhead gear hammock or the Big Agnes Entertainment Center loft. More than likely, your bike adventures include a friend, and the folks at Mountain Safety Research have you covered. The MSR Elixir 2 is a freestanding, lightweight two-person tent for $249.95. Easy to assemble, the Elixir 2 weighs in at just under six pounds and folds up into a 7- by 20-inch bundle to fit in a storage bag or bungee to the backrest. With a bathtub-style floor and taped-seam rainfly, you’ll stay warm and dry in this three-season shelter. It has two doors and two vestibules, which means you don’t have to climb over your companion to get in or out. If assembly isn’t your strong suit, the Elixir 2 features color-coded poles, clips and webbing to get you set up quickly, and interior pockets give you places to stow your gear. Of the tent choices on my five-best list, the Elixir 2 is the only one that includes the additional groundsheet. I couldn’t possibly have a "best tent" list without a Hilleberg representative. The Hilleberg Staika is a dome-style, freestanding two-person tent and it is the only four-season tent on my list for those of you whose adventures include snow. (Ural sidecar riders, I’m looking at you.) It’s also the most expensive tent on the list at $945. You get what you pay for, though, and Hilleberg tents have weathered the worst Mother Nature has to offer even on the Arctic tundra so I’m confident it can handle the weather anywhere an adventure bike can go. 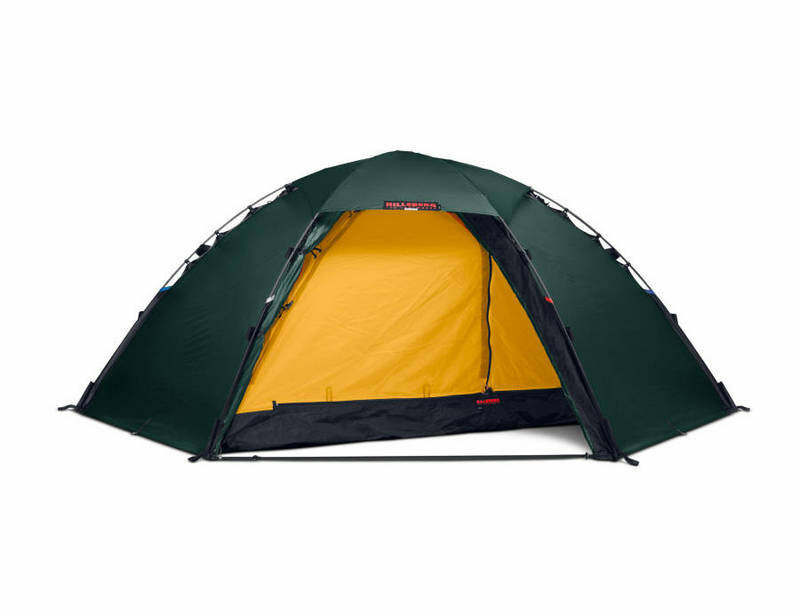 Among the non-garage tents on the list, the Staika is the heaviest at almost nine pounds, but it is spacious and stable. For all its sturdiness, the Staika folds up into a manageable 8- by 22-inch bundle — quite doable for onboard storage compartments or bungeed to your backrest. You want to sleep with your motorcycle, now admit it. The three-season Mototent from the folks at Lone Rider houses up to two people and your motorcycle and still has room for your gear and an ample "patio" area where you can sit and relax or cook out of the weather. A color-coded pole system helps you set this up quickly. The 51-inch-wide motorcycle bay is wide enough for full-size adventure bikes and attached hard cases. At 12 pounds, this is the lighter of the two garage tents but at 9 inches by 24 inches, it is the larger bundle when folded up. Still, if it takes up too much room in a storage case, bungee it to the backrest. I like the 6-foot-plus ceiling height, and with four doors and two vestibules, you won’t have to climb over your companion. As an added bonus, you can detach the inner tent and use the outer tent as a large garage for doing maintenance and repairs on your bike. The Mototent can be yours for $499.00. 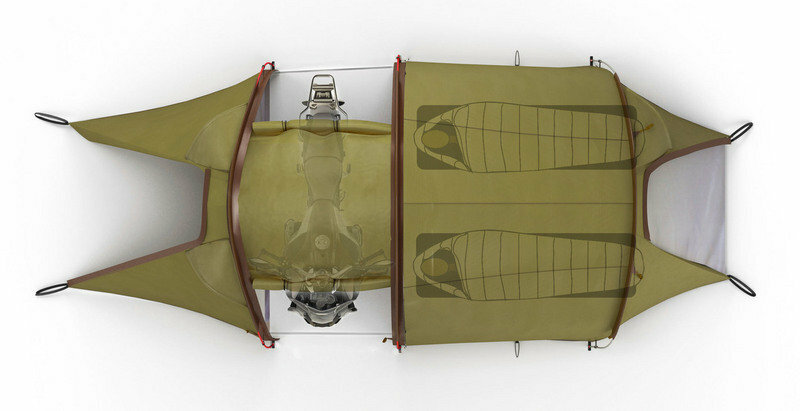 The folks at Redverz offer my last "best-list" pick with the Atacama Expedition Motorcycle Tent in green or yellow for $499.00. Another "sleep with your bike" tent, the garage bay is 36 inches wide — not as wide as the Mototent, but wide enough for a lot of bikes out there. An improvement over prior versions of the model, the Atacama has mosquito netting, and the 10-inch bathtub floor keeps you dry. At over 14 pounds, this is the heaviest tent on the list. However, it does fold down to a manageable 9- by 21-inch bundle. The sleeping area in the Atacama holds up to three people and is spacious enough to accommodate full-size cots and all your gear. Three people and four doors means no climbing over your bunk mates.